Two nights ago, it was time to get the boys ready for bed. For some reason, NHL was complaining so B went to take care of him while I got JSL ready. Don’t ask me why, but I decided to pull JSL’s shirt off of him while he was standing on a stairwell. As the shirt went up, JSL lost his balance and fell. He went clunking down the stairs and slid to a halt face down and not moving. I screamed for B to call 911 and then… I woke up. Yes, all of this was a nightmare. A horrible nightmare. Although, I was relieved that it wasn’t real, I lay awake in bed afraid. I was terrified that, should I go back to sleep, I would re-enter the dream from where I left off – with JSL lying lifeless on the floor. The image of JSL laying there, face down with his arms splayed, was (and remains) burned into my brain. Though I was exhausted, I forced myself to stay awake for a few minutes. Thankfully, the rest of my dreams were free of injured children. Have you ever experienced a very realistic dream about your children being hurt? 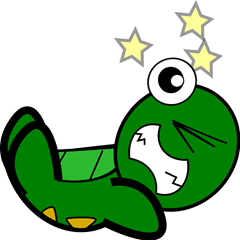 Disclaimer: The image above, Turtle-Hits the Floor, was obtained from OpenClipArt.org.